I hate cold and I hate the winter. That partly explains why I don’t ski, snowboard, or ice skate. If it’s 30 degrees, I’m not exactly looking around for reasons to hang outside for hours at a time. I like watching snow fall out a window while I’m warm inside (as I’m doing right now), and I can enjoy the occasional snowball fight, but other than that winter does nothing for me. Accordingly, I don’t particularly enjoy watching skiing, snowboarding, speed skating, or figure skating competitions. But, for two weeks every four years, I LOVE watching these sports. Those two weeks have come around again and will start on Friday night and I can’t wait for the start of the ski jumping competition that night. I know I’m not alone here. I know a bunch of people that would never consider watching a downhill skiing event who suddenly don’t want to miss the Super G semis when it’s Olympics time. Why is this? Do we all just buy into the hype of the Olympics? Are these legitimately decent spectator sports that we don’t give enough respect to 99% of the time? Actually, there’s a simple reason that the Winter Olympics are awesome: in so many of the events, absolute disaster can (and often does) happen at any time. Now, obviously this is true of these sports all the time, but who cares if a random figure skater falls on his face in the Paris Open, or whatever events figure skaters do besides the Olympics. For most Olympic athletes, the main goal of their entire lives has been to get to this stage. They’ve spent the last four years pouring everything they had into this sport so they could represent their country at the Olympic Games. They’ve spent many more years than that learning the craft, and dreaming about this very moment that we’re now watching. And, in the blink of an eye, it can all go horribly wrong. I guess that sounds morbid, but it’s not like we’re rooting for them to fail. I mean, sometimes we are, but usually not. It’s just the combination of the fact that disaster could strike, and that the stakes are so high for the competitors, that these events become riveting. A downhill skiier could lose his edge and go flying through the air. A speed skater could slip coming around the last turn and nail the wall. A ski jumper could do this (0:50 mark). A figure skater could go for the quadruple lutz, and not make it. A bobsled team could flip right over. You never know when the moment could come, so you have to keep watching. And, not to get sappy now, but when a competitor makes it through and avoids all the pitfalls and gives the performance they always dreamed they would, that can be pretty cool to watch too. Anyway, I know that there is a good chance that I may be proven crazy on this one, but here is my hypothesis: This year’s “Redeem Team” is BETTER than the Original Dream Team, making it the best basketball team ever assembled. Hold on one second and allow me to make a couple of points before you rip me apart for this. 1). I would never, EVER claim that if you take the players on the ’92 team in their prime against the players on this team in their prime, that this team is better. A big part of this argument will rest on the fact that guys like Bird and Magic were far past their peak years. I mean Magic was retired. 2). I will also not claim that the run that that the ’08 team is having through the Olympics even compares to the run through the Olympics that the ’92 team had. 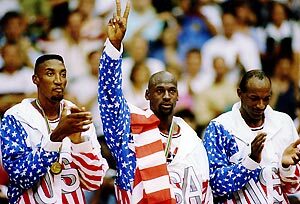 Yes, the Dream Team opened the Olympics with a 116-48 win over Angola. They cruised through the Olympics with a 9-0 record and an average victory margin of 44 points per game. Their closest game was the gold medal game against Croatia, where they won by a measly 33 points. They only trailed once in the entire tournament, and Coach Chuck Daly did not need one timeout in any of the nine games. 3). I have trouble believing that the Redeem Team would win a one-game, winner-take-all game between the two, even as they were constructed because the ’92 team had guys like Jordan, Barkley, Bird, and others that just would not lose. However, I still think that this year’s team is better–meaning that if the two teams played the same 100-game schedule the ’08 team would have more wins, and even if the two teams played each other 100 times, the ’08 team would win the majority of them. Why? Let us start with personnel. I think that this team is considerably more athletic (remember, Magic, Bird, and Drexler were all in the back-ends of their careers). I think that this team is very well-constructed, in that they have a high-octane backcourt, with a lot of depth at the point (Paul & Williams off the bench), and they teamed that up with extremely athletic big men (Howard, Bosh, and Boozer). Secondly, and this may come as a bit of a surprise, I think that this team plays better defense than that team did–particularly at the point and transistion, full-c ourt defense. Finally, I think that this team has even more scoring options than the ’92 team, which featured 10 of the 50 greatest players of all-time. I still have absolutely no idea how anyone could possibly figure out how to stop this team on offense. Not only do they have absolutely incredible scorers (LeBron, Kobe, Carmelo, Wade, etc. ), but they all pass very, very well, so these phenomenal scorers all get good looks. Then, you can bring a dead-eye shooter (Michael Redd) off the bench or let the offense run through a pair of point guards, who are not too shabby at scoring the ball either (Paul & Williams). Yes, they lack the back-to-the-basket scorer, but they are proving that that facet of the game is not as important in the up-and-down international game. Finally, let us just look at results. Yes, as I stated above, the Dream Team won 9 straight by an average of 44 points per game. Yes, I know that they only trailed one time (25-23 in the first quarter of the gold medal game against Croatia, which they won by 33). But, I think it is inarguable that the level of play in these Olympics is astronomically better than it was in 1992. I am not saying that the Dream Team would not win gold if they were to play in 2008, but I think they would struggle–and this team is not. At least, so far. Thanks to the wonders of modern technology, I’ll relax on my couch in Brooklyn today and watch the Olympics in China, the PGA Championship in Michigan, and the Phillies game in Philadelphia. It’s certainly an interesting Sports Sunday and it starts early with the broadcast of USA vs. China in Olympic basketball. Predictably, NBC is airing a story on Yao Ming right now. Also predictably, I know nothing about China’s team other than Yao. It should be interesting to see how the US decides to defend him, because Dwight Howard is really the only center on the roster. I wouldn’t be surprised to see them throw a zone defense and see if these Chinese guards can hit some shots. 10:16 AM: Howard wins the tip from Yao. USA starting lineup: Jason Kidd, Kobe Bryant, Lebron James, Carmelo Anthony, and Howard. Yao hits a 3 to start! Maybe a zone won’t work (and yes, the US has come out in a zone). 10:20 AM: Oh, China has Yi Zianlian, of course. They also have a guard that was apparently drafted in the second round by the Lakers in 2007. He hit a 3 already. Early 11-9 lead for China, and the crowd is really into it, of course. Chris Paul checks in. Many people have pointed out that Paul has surpassed Kidd, and it should be interesting to see who gets the bulk of playing time at the point, with Deron Williams also in the mix. 10:36 AM: The first quarter ends with the US leading 20-16. Kidd has not come back on the court, and Paul and Williams have on the court together, which I think is a great idea. China’s been knocking down some 3’s. I see Jim Boeheim is an assistant coach. No word on whether or not he tried to get this game played in the Carrier Dome. 10:47 AM: China just keeps sinking the 3’s, they’re 7-11, and have the game tied at 29. It definitely hasn’t been an encouraging game for the US so far. Obviously they have a ridiculous advantage in athleticism but they’ve been a bit sloppy and haven’t shot the ball well, which has been the Achilles heel of a lot of these international teams. If they were playing like this against Argentina, they’d be down double-digits right now. 11:00 AM: It was a disastrous close to the half for the Chinese, as the US delivered what should be a finishing blow and taking a 49-37 lead. The US started bringing some pressure defense, which you would love to see more of considering their 12th man is an NBA All-Star. Fatigue will never be an issue for the ‘Redeem Team’. 11:32 AM: The US has really just enforced their will here in the third quarter, carrying over the momentum from the end of the first half. They still haven’t got the offense clicking on all cylinders but the defense has been pretty stifling and China looks worn down. It certainly won’t help that Yao just landed awkwardly and looks like he rolled his ankle. 69-48 US with just over a minute in the quarter. 11:57 AM: Well, it turned into a blowout win for the Americans, but there are still question marks for this team. They’ll get Angola in their next game, so there probably won’t be much figured out in that one either. One of my favorite sports quotes ever came from Charles Barkley during the 1992 Olympics. He was asked what he knew about Angola and responded, “I know they’re gonna lose!”. Final score: USA 101, China 70. Craig Sager looks disappointed that he had to wear the NBC golf shirt and not one of his purple and gold suits. 1:17 PM: After catching some rowing events that were probably about as exciting as rowing gets (i.e. not even a little bit), I’m ready for a switch over to baseball, as the Phillies get ready to finish up their series with the Pirates. The Phillies offense has been shockingly bad lately, but they did manage to break a 23-inning scoreless streak last night and beat the Pirates, 4-2. They cling to a one-game lead in the division over the Mets, and they’ll send Jamie Moyer to the mound today. The Pirates starter is some guy I’ve never heard of, Jason Davis, who has appeared in 4 games out of the bullpen for Pittsburgh this year. 1:35 PM: Rain delay in Philly. On the bright side, water polo is on the Olympics now, USA vs. China again. I guess these guys make a bit less money than the basketball players. This is probably the hardest sport in the world to play. US leads 3-0. 2:09 PM: Ah, the PGA Championship, everyone’s least favorite major. The CBS coverage is just getting underway. By the end of the day we’ll know who gets to join such golf luminaries as Shaun Micheel and Rich Beem as champions of this tournament. It’s quite an underwhelming leaderboard, with Ben Curtis and JB Holmes at the top. Padraig Harrington and Sergio Garcia lurk 3 shots off the lead. It will be interesting to see if either of those two can make a move. This is one of the 6 days each year that I make an effort to watch golf, so hopefully we get more than a Curtis-Holmes duel. 2:13 PM: I don’t understand Ben Curtis’s hats. I remember in the past seeing him wear a Chicago Bears hat while playing and I thought he was just a big fan and/or didn’t have any sponsorships. But today he’s sporting a Detroit Lions hat, with Titleist written on the side of it. Does he have some sponsorship deal with the NFL? Is he just a big football fan? I need an explanation here. Maybe Jim Nance will touch on this in a witty aside at some point. 2:20 PM: Well, Holmes might be exiting stage left, right at the start of his round here. He put his drive into the trees and then took a hack to get it out and the ball went about four feet. Now he’s taking a drop. It’s always fun to watch a professional athlete look completely incompetent. 2:48 PM: Well, apparently it’s raining everywhere in the whole world. The Phillies are still in a rain delay, the golf tournament in Michigan has had terrible weather, the beach volleyball match in the Olympics is being played in a torrential downpour, and there’s a severe thunderstorm warning scrolling across the bottom of my screen. Anyway, the final round in Michigan has gotten off to a crazy start, with Sergio Garcia and Phil Mickelson making strong moves. Sergio is still looking for his first major, and that always makes for an intriguing storyline. Long-time players in search of their first major tend to feel a ton of pressure over those last few holes. 12:15 AM: Well, thanks to Verizon wireless, my internet connection went out just as the Phillies game was getting underway. The Phillies won an (apparently) exciting game on a 3-run homer by Chase Utley in the 7th inning. At the PGA Championship, Sergio Garcia and Padraig Harrington DID make a move and it WAS very interesting and entertaining, with Harrington taking his third major in the last two years and establishing himself as clearly one of the top players in the game right now.